Mighty No. 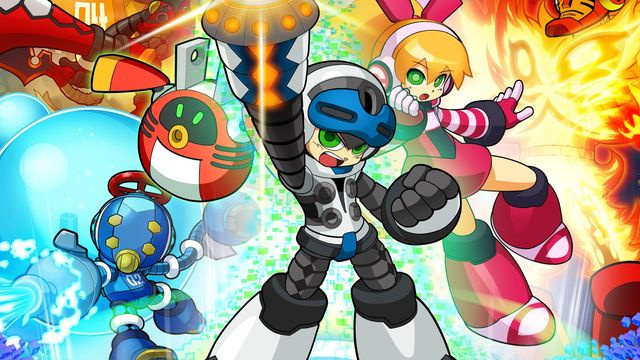 9 is just a few months away, a project treated by many as a spiritual successor to Mega Man. Though we don't yet have a final date for the 3DS port, it's heading to Wii U in September on the eShop and as a physical retail release. A development update has now been posted outlining features for each platform, and it's a mix of good and bad news for the Nintendo versions. The 3DS option will have 3D support, for example, but the Wii U version won't have any Miiverse functionality. For those of you harbouring - unrealistic - expectations of amiibo, meanwhile, consider that avenue officially closed. It's a bare minimum of support, arguably, though the Nintendo versions will at least utilise their additional screens in platform-specific ways. Are you excited about Mighty No. 9? I don't care too much about 3D these days. Does the GamePad support on Wii U also mean touchscreen support, then? If so, I'd probably lean toward the Wii U version. The GamePad tends to be more comfy than the 3DS. No Miiverse support? WHAT!? Is this the first game not to support it? Were people really expecting Amiibo on a multiplat game? Even Yooka-Laylee, i am not expecting it. What does no "Miiverse functionality" mean, no Miiverse community at all or just lack of something similar to what Shovel Knight had? weird. miiverse support is not even mentioned for the 3DS version. i dont think the game will not have miiverse on any system. i dont care about the rest of the features except 3D. we are talking about a 2D-action platformer or whatever you wanna call it. Well lack of Miiverse is pretty pathetic, even shovelware has it. Almost the bare minimum, but as long as it plays well, I'm not mad. Surely there will be a Miiverse community. There are very few games without one and it takes virtually no work at all to enable. I'm sure it just means no unique Miiverse functions like in-game interactions or whatever. We won't be seeing Miiverse posts pop up on the walls with tips on how to beat bosses, but I have no doubt we'll be able to pause the game to upload a screenshot and lament our terrible skills. Guys, im pretty sure that "no Miiveser support" only refers to stuff like Splatoon does it, showing messages in the game etc. It does not mean that there wont be a MV Community at all. No Miiverse support? That's...strange...not that I care either way, though. EDIT: @Einherjar Oh, okay. That would make sense, then. It seems like Deep Silver wants you to get it on PS4 or Xbox One. I'm doing this on PS4 and 3DS. I want this on my 3DS most though. Would've been cool to have my Mii in a Mighty 9 outfit, running through the game and some sort of street pass support. Not bummed, but confused about the lack of interest/enthusiasm on the system that probably going to net them the greatest monetary return. The WiiU, I understand. I backed this on Kickstarter. Does feel like a long time ago now. I'm going Vita on this one, sorry NL. @Gen0neD Whoa, buddy. 15 million in the US, 50 million worldwide. 270 million is an insane number of machines and only applies to the total amount of all Nintendo-branded systems sold in the US. Like, NES and Game & Watch through Wii U and 3DS. The whole history. @sketchturner it could mean something else, I believe some games have said that too before. I think it said that for MH3U, but it just meant that posting pictures wasn't available so there may still be a community though. you cannot use miiverse on the wii u version! how disappointing! 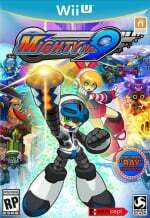 still going to get mighty no.9 for both wii u and 3ds! Yeah I'm like 100% certain the no Miiverse means no in game messages. There's definitely gonna be a community, don't worry ! Lack of Miiverse support is pathetic. The game as a whole looks really underwhelming and disappointing, definitely not wasting my money on this one. NOOOOOOOOOOOO, I CAN'T LIVE WITHOUT NINTWITTER!! I'll take 3d over HD any day! Not too bother about lack of features as long as the main game is good. Not so sure it will be at this point. The lack of Miiverse is baffling. It couldn't possibly be too difficult to integrate something that is already fully functional. Could be through "emergency signals" that are level-specific and show up as small messages on the GamePad/Touchscreen. And while 3D really isn't that important for the game, I can't help but see it as lazy not to implement it when the game is layer-based, anyway. Streetpass and amiibo support are a bit much, though. That'd require either the integration of exchangeable data, or even the addition of an entirely new feature to make use of it at all. @Soundtoxin Not a New 3DS owner, huh? Even though I only know the game by title — no details except for it being a mega man successor — I have high hopes and will be getting the 3DS version since I love platformers like this. Here's to hoping it's good! But will it be 60 fps on both platforms? I've slowly lost all interest in this game. @CrimSkies97 I am actually. I have the MonHun N3DS XL. Why? Well, it would have been hilarious if the game used the Mega Man amiibo for something. Why are Miis and touch controls mentioned for 3DS but not WiiU and motion controls and Miiverse vice versa? They all have them all. Unless by motion controls the mean specifically Wiimotes and not gyro? Also I'm guessing the Miiverse is it being integrated into the game as all games get a community by default. They should have worked with Nintendo to have an amiibo for it. Would have been nice for stripping us of the statue and a lot of people would have either double dip on a Nintendo system or bought the amiibo on its own. But I guess that to afford amiibo Inafune would plug us yet another KS campaign, so maybe it is better this way. I'll wait for reviews on this game as it really comes off underwhelming. Why the Dancing Dragon would there be Amiibo support for it anyway? @Rosalina Not really, given the reason is because it was a stretch goal and people paid enough to meet it. Not really a luck thing. Granted, all of this sounds plenty reasonable and I'm not particularly interested in the game anyway. well, there's a game series called mega man you see, and it has a very dedicated fanbase, but no new games have come out in 5 years. the fanbase is starved for a jump and shoot game in the style of mega man, and this is a jump and shoot game in the style of mega man, made by the second father of mega man, the lady that did the okay music for mega man 1, and Inti Creates, the people who made/worked on the Mega man zero series, gunvolt, shantae half genie hero, mega man 9 and 10, and bloodstained. Inti creates alone should be enough to make one hyped for the game! @Tao And today's game is: Let's see how long your comment stands, as is, before its edited for you. Aaaand... Go! then we are lucky people funded it enough for the port, or that it was even considered as a stretch goal, or that so many people asked for it during the campaign. Glad the 3DS one is getting 3D and touch screen support. Those are the most important features for me out of the ones listed above. I didn't grow up playing Mega Man, so there's not much "hype" here for me. That being said i'm definitely still gonna get this game when it comes out. Well, I backed the damn thing, so I am excited. I chose the Wii U version, and all I care about is just playing the game. Classic Controller TBD?.. Really? Pretty much all you need to do is change the input, it's not like the touch screen is important to this game anyways. @Gen0neD no, it's not. PS4 has been easily outpacing competitors in preorders for MN9. Wii U is in second, though. Like someone said above "people were expecting amiibo support?!" Pfft! Guys & gals the wii u version isnt even getting the signature edition like the xbox1 & ps4 versions r getting. the least they could give is miiverse support....and we not even getting that?!!! whistle "Dang.... I know. I know. we should be lucky we r even getting the game...blah blah blah... but this is kinda BS. Just a little bit man. Just a little bit." Needs Classic Controller support, or I won't be buying the Wii U version. I've discovered recently (whilst having to use it to play Splatoon) that my hands are cramping up badly having to use the Gamepad for any extended amount of time. I'm glad it doesn't have Amiibo milking support. First make them obtainable for the average Joe Gamer, THEN make games that support them. I know and it ticks me off. Will we be getting a physical copy for the 3DS?